Twist the colour squares to release the pen lid - with our Rubiks Cube Pens with Logo Branding you can deliver an excellent quality business gift with a fun factor added to it. With a company brand name print along the barrel you can be sure to get your name out and about, and with documental black ink insert provides quality and performance with this promotional ball point pen. 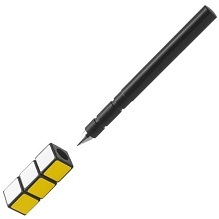 Why not unlock some more potential with these Rubiks Cube Pens with Logo Branding and entertain your customers? For a FREE QUOTE, please fill in the form regarding our Rubiks Cube Pens with Logo Branding and we'll be able to help you.